Demand for these products is highest during the Qingming "tomb-sweeping" festival, which happened last month. "We fully respect the funeral context and we trust that the store owners did not have the intention to infringe Gucci's trademark," Gucci Hong Kong said in a statement. "Thus a letter was sent on an informational basis to let these stores know about the products they were carrying, and by asking them to stop selling those items." The ancient tradition of venerating one's ancestors, even after death, is alive and well in the Chinese speaking world. It is based on the idea that these spirits continue to influence the lives of the living. If you want to avoid bad luck, the belief goes, then you'd better keep your ancestors happy. How? Traditionally, it was by regularly tending their graves, bringing them fresh fruit and gourmet food and drink and burning joss paper. Also known as "hell money" or "ghost money", they are pieces of paper money in outrageous denominations, which are meant for use in the afterlife. And these days, devotees can burnish their reputation with their deceased ancestors by offering items that many were never able to enjoy while still alive: luxury cars with European drivers, brand-name clothing. One of the best sellers at these shops are enormous villas complete with swimming pools, multiple car garages and Western domestic helpers. Gucci has not said which shops or how many had received the letter. 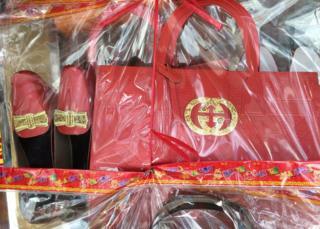 In Hong Kong, some of the shops that had reportedly received the letters had removed their Gucci wares. But other brands, including Louis Vuitton, Yves St Laurent, Burberry and New Balance were still on sale. Hong Kong residents shared a mixture of comedy and scorn on social media. "Does Gucci want to open branches in the underworld?" Vincent Charles asked. Sammi Ng said on Facebook: "Maybe Gucci should launch their own paper offering products." Sai Ken made reference to Gucci pricing: "Living people cannot afford (Gucci products), and they still do not let you own Gucci products after death!"